In recent years, we have received requests and suggestions to add retail type functionality to our company store technology. You asked for it and we built it: Promo Commerce, Retail Style in our bright sites eCommerce system. 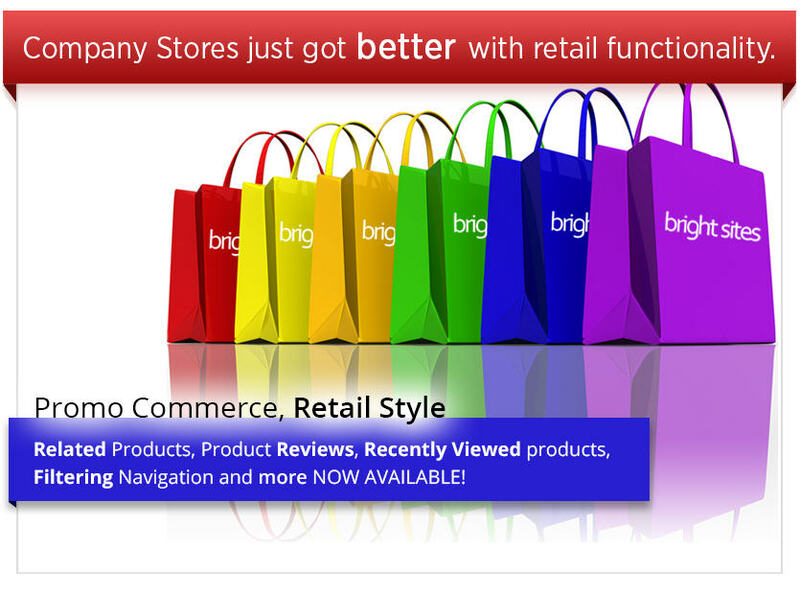 Bright sites is our new promo-industry specific web, catalog and company store software. Bright sites platform brings you the three R’s; Three retail shopping options that are familiar and desired by your shoppers: Products Reviews, Recently Viewed Products and Related Products. We also added in filtering navigation, a useful feature when browsing for items on the store. Find the specific product you’re looking for by utilizing Filtering Navigation. Once you select a category, it will allow you to narrow down your search by color, size, vendor and more by using this option. Search engine optimization (SEO) is included with every site. Potential customers need to find your site. SEO tools are built in to make it easy for you to set up. Want to share that cool new product you have on the store? Now you can with social media integrations. The social media integrations allow your users to spread the word about the great products they found on your web site. For more information on these features and bright sites, please visit our website at brightsites.com or call us at 800.466.5930.